UK brand A Real Lifestyle return with a new drop, comprising of 3 new colourways of their popular Gentleman’s Pocket T-shirt, returning in new fabrics with an updated design. Whilst not being a huge leap forward from previous designs, the use of deadstock plaid and pre-washed denim pockets has lead to three really nice tees; smart, with a street edge. 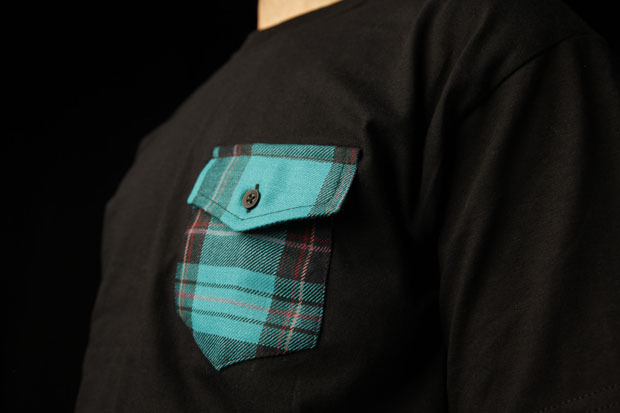 The tees come in black with aqua plaid pocket, grey with red plaid pocket and white with a denim pocket, which features a button down design with A Real Lifestyle logo tab hidden under the flap. The pocket tee is a wardrobe staple, casual enough to wear on the street, but smart enough to be incorporated into a more formal outfit. Check below to see the three tees in detail, and pick up yours now from A Real Lifestyle. black w green pocket so dope, mines on order. Looks like leftovers from urban outfitters lol.